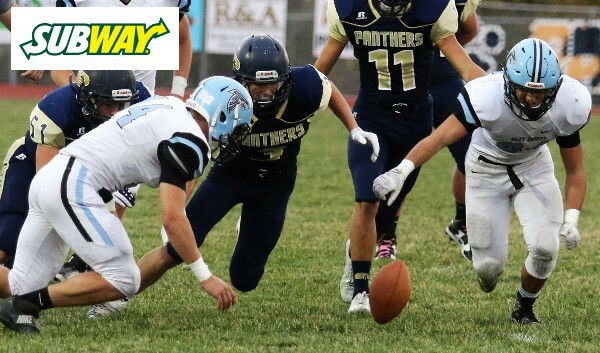 On this special Tuesday Playoff edition of the Subway Fresh Take, we’ll recap first round playoff action from Class 3A and both 8-Man divisions. Nemaha Central 61, Pleasant Ridge 6 – Nemaha Central used big plays early to overwhelm Pleasant Ridge in a 61-6 rout. The Thunder scored on a 90-yard touchdown run by Jacob Koelzer and an 85-yard touchdown pass from Ryan Hasenkamp to Mitchell Henry. Koelzer added another touchdown run and another Hasenkamp to Henry connection stretched the lead to 27-0. Henry later added a punt return for a touchdown. Silver Lake 50, Mission Valley 0 – Legendary Silver Lake coach C.J. Hamilton picked up his 400th career victory in style as the Eagles rolled to a 50-0 shutout of Mission Valley. Dalton Dultmeier tossed a pair of long touchdown passes as the Eagles quickly jumped on the Vikings. Silver Lake led 36-0 at halftime. Hamilton improves his overall record to 400-89 with the win. Wellsville 54, Humboldt 6 – Wellsville raced out to a 21-0 lead after the first quarter and cruised to a 54-6 win over Humboldt. The Eagles led 42-6 at halftime. Wellsville will travel to Galena to take on the Bulldogs at Abbey Field on Saturday. Galena 42, Fredonia 14 – Galena cruised to a 42-14 win over Fredonia. Quarterback P.J. Sarwinski rushed for two scores and passed for two more touchdowns as the Bulldogs built a 34-0 halftime lead. Sarwinski added a third touchdown pass in the third quarter for a 42-0 lead. Galena began subbing and Fredonia added a pair of touchdowns on runs by Isaac McPherson in the fourth quarter. Sabetha 62, Maur Hill-Mount Academy 28 – Maur Hill couldn’t slow down the Sabetha offense on Tuesday night as the Bluejays ran away with a 62-28 win. Ronald Faulk-Tindel’s 60-yard touchdown run pulled MH-MA within 21-14 before the Bluejays scored the final 20 points of the half. Rossville 41, Perry-Lecompton 14 – Rossville and Perry-Lecompton traded first-quarter touchdowns before Jacob Bradshaw took over. Bradshaw added three touchdown runs and Dawson Hammes added a short touchdown run as the Bulldawgs took a 34-6 lead into halftime. Rossville will have a tough road test on Saturday at Sabetha. Osage City 20, Jayhawk-Linn 14 – Osage City went on the road to Mound City and came away with a 20-14 win over Jayhawk-Linn. The Indians got the winning score on a long touchdown pass with less than five minutes remaining. On paper this may look like a major upset as Osage City entered with a 4-5 record and Jayhawk-Linn was undefeated. But Osage City had played some competitive games against solid Flint Hills League competition, while Jayhawk-Linn’s opponents were a combined 28-55 on the season. Caney Valley 51, Riverton 14 – Tri-Valley League champion Caney Valley cruised to a 51-14 victory over Riverton. The Bullpups led 30-14 at halftime and shut out the Rams in the second half. Riverton entered the game with just two wins on the season, both coming in district play. Garden Plain 12, Wichita Independent 7 – For a second consecutive season, Wichita Independent tried to pull off a first-round upset in Class 3A. The Panthers shocked Cheney 17-13 a year ago, but fell to Garden Plain 12-7 on Tuesday night. Independent had several potential touchdown pass attempts fall short in the final minute. Garden Plain led 6-0 at halftime and 12-0 at the end of three quarters. Independent cut the lead with a touchdown with 8 minutes, 32 left in the contest. Marty Landwehr rushed for 156 yards and a touchdown to lead Garden Plain. The Owls (9-1) are 4-1 in games decided by nine points or fewer this season. Halstead 36, Southeast of Saline 22 – Halstead beat Southeast of Saline for a third consecutive season to open the playoffs. The Dragons didn’t take their first lead in Tuesday’s game until late in the third quarter when Chase VanSteenburg broke a 62-yard touchdown run for a 26-22 lead. The Dragon defense then got a safety, and VanSteenburg added his third rushing touchdown of the game for a 36-22 lead. Trailing 22-12 late in the third quarter, Layke Heimerman returned a Trojan interception for a touchdown to pull the Dragons to within 22-20. Norton 28, Marysville 20 – Norton led 21-0 at halftime and held on for a 28-20 road win versus Marysville. The Bulldogs entered the game tied for the best scoring defense in Class 3A, and Norton tallied the most points on Marysville’s defense this fall. The Bluejays won a first-round playoff game for the third straight season. Norton’s first two scores were set up by a Marysville fumble and blocked punt. Hoisington 56, Lakin 13 – The No. 1-ranked Cardinals delivered another big first-round playoff victory with a 56-13 home win against Lakin. Cam Davis scored from a yard out and Hunter Hanzlick tallied a 28-yard score for a 14-0 lead at the end of the first quarter. Sean Urban added an 83-yard kickoff return touchdown and a 21-6 advantage in the second quarter. Hoisington led 56-6 midway through the third quarter en route to its third straight first-round playoff victory. Chaparral 48, Douglass 16 – Chaparral defeated Douglass for a second time this season with a 48-16 win on Tuesday night. The Roadrunners led 20-0 after the first quarter and had expanded it to 48-0 after three quarters. Chaparral (9-1) advances to travel to Hesston for Saturday’s second-round game. Hesston 48, Sterling 8 – Hesston had little trouble with Sterling in a 48-8 victory. Zach Esau found Zach Vogt for a 42-yard touchdown pass. The two combined for another score later for a 21-0 lead. Hesston is 5-0 against Sterling in the last decade with all five wins by at least 35 points. Phillipsburg 49, Riley County 27 – The Panthers are 10-0 for the first time in program history as they pulled away in the second half for a 49-27 home win versus Riley County. The Falcons led 20-15 late in the first half, but the Panthers scored for a 23-20 intermission lead on a five-yard run from Trey Sides. Riley County took a 27-23 lead with 5:56 left in the third quarter before the Panthers tallied 26 unanswered points. After the Falcons’ TD, Kirk Coomes quickly responded with a 28-yard touchdown run. Mark Coomes, hurt the last several weeks, delivered a 53-yard run that set up a TD for a 35-27 lead. Larned 35, Cimarron 30 – The Indians pulled off another stunner and won its second straight upset with a 35-30 road win against Cimarron. The Indians were 2-6 in its playoff history entering this season and 2013 its lone playoff appearances since 1985 – which also marked its last playoff win. Larned started the season 0-6 and earned a playoff berth with a 42-21 Week 9 victory versus Ellsworth. St. Paul 78, Peabody-Burns 32 – Chandler Struthers scored four of his five touchdowns in the first half as the Indians rolled to a 78-32 win over Peabody-Burns. Struthers scored four touchdowns, Braven Born added a score, and lineman Anthony Albertini scored late in the second quarter for a 48-6 lead. The Warriors added a late second-quarter touchdown that extended the game. Struthers and Born each scored in the second half, and Austin Reynolds added a pair of touchdown runs for St. Paul. Burlingame 72, Solomon 46 – Burlingame surrendered almost as many points on Tuesday night as they had all season, but the Bearcats still exploded for a 72-46 win over Solomon. Burlingame entered having given up only 54 points all season, while Solomon was throttled in a 54-6 loss at Victoria last Thursday night. Burlingame led 30-16 at halftime, then added 30 more points in the third quarter alone to pull away. Quarterback Dalton Sporing rushed for four touchdowns and threw touchdown passes to four different receivers. The Bearcat defense also scored a pair of touchdowns in the second half. West Elk 54, Oxford 30 – West Elk played from behind for the entire first half, but finally took a 24-22 lead on a Chase Vandergrift touchdown run mid-way through the third quarter. The Patriots never looked back on their way to a 54-30 win over the Wildcats. West Elk defeated Oxford 68-20 back in Week 2 of the regular season. The Patriots will now host fourth-ranked Osborne on Saturday. Osborne 64, Clifton-Clyde 16 – Osborne’s quick-strike offense had just 12 first-half plays and tallied seven touchdowns en route to a 64-16 victory. Osborne led 50-8 at halftime. The game ended on a 43-yard pick-six from senior Cullen Grabast with 1:23 remaining in the third quarter. Osborne (10-0) scored 36 points in the second quarter versus 8-2 Clifton-Clyde. Osborne had 287 rushing yards and Denton Schurr and Grabast each tallied more than 100 yards. With injured quarterback Justin Burch out, Grabast played quarterback and completed 3 of 5 for 68 yards with two touchdowns. Burch is expected to return. Central Plains 60, Argonia-Attica 20 – The Oilers won a first round playoff game for the fourth straight season with a 60-20 home victory against Argonia-Attica. The Titans led 6-0, 12-8 and then 20-16 after a kick return for score. However, Central Plains scored 44 unanswered points. A&A was much more turnover-prone than the Oilers this season, and Central Plains took advantage of several miscues. Central Plains will play host to Spearville on Saturday, the third straight year the teams have played in the second round. The winner of this game has won the Division I championship each of the last two seasons. Spearville has won 23 straight dating back to its 42-40 playoff loss to Central Plains in 2014. Spearville 52, Atwood-Rawlins County 6 –The Lancers extended their winning streak to 23 games with a 52-6 victory against Rawlins County. The Lancers led 30-0 after the first quarter and 44-0 with 1:18 left in the second quarter. Luke Heskamp rushed for three touchdowns, and Kolby Stein added two touchdown runs, a fumble return for a score, and a touchdown pass. Spearville has defeated the Buffs, 52-14 and 64-14, in the first round of the playoffs the last two seasons. The Lancers have won nine of 10 games by the 45-point margin this year. South Central 54, Little River 28 – South Central used a 34-12 halftime lead to defeat Little River, 54-28, at home. South Central led 34-20 late in the third quarter before pulling away. The T-Wolves, under first-year coach Billy Nichols, moved to 9-1 and ended a streak of four straight first-round playoff losses, including the last three seasons. South Central has played most of the season without its two stars, quarterback Gerald Morehead and lineman Kody Huck. St. Francis 54, Ness City 0 – The No. 2 Indians led 24-0 after the first quarter and ended the game at halftime. Quinton Cravens had a 14-yard TD run on the Indians’ first possession, while Taylor Rogers had a nine-yard scoring run on the second possession. Tate Busse had a pick-six in the final seconds of the first quarter. In the second quarter, Rogers tallied a 55-yard scoring run. A Rogers’ interception and a blocked punt set up two more scores. Sainty’s defense limited the Eagles to 58 total yards. Rogers had six carries for 99 yards and two TDs, and Cravens threw for 95 yards and a score. Hutchinson Central Christian 108, Lebo 62 – In the playoffs for the first time in 20 years, Hutchinson Central Christian made its mark with a 108-62 win at Lebo. The Cougars and Wolves fell just 12 points short of the combined state record for points in a game set in Onaga’s 114-68 win over Valley Falls last Thursday. Cougar quarterback Nate Heneha passed for 200 yards and 3 touchdowns and rushed for 213 yards and four scores. Logan Miller added 102 rushing yards and four touchdowns, while Elias Butterfield had over 130 receiving yards and two scores. Lebo was paced by senior quarterback Drew Ott who passed for 350 yards and six scores. Peyton Baldwin had 255 receiving yards and five touchdown catches for the Wolves. Hanover 38, Beloit St. John’s-Tipton 12 – The Wildcats led 16-6 with four minutes left in the second quarter and pulled away in the second half for a 38-12 home victory. Hanover has allowed just 44 points this year. The Wildcats have captured eight straight first round playoff contests dating back to 2006. Hartford 68, Waverly 48 – Hartford beat Waverly 68-48 behind a huge night from standout back Clayton Fowler. The senior back rushed for 330 yards and eight touchdowns in the win. Hartford led 32-22 at halftime and 38-28 mid-way through the third quarter. Waverly responded behind two Peyton Mitchell touchdown runs to take a 42-38 lead with 2:41 remaining in the third quarter. Fowler would score the game’s next three touchdowns to put the Jaguars up 62-42 mid-way through the fourth quarter. Mitchell rushed for five touchdowns to lead the Bulldogs. He wasn’t at full strength in Waverly’s 60-14 loss to Hartford to open the season. Pike Valley 54, Wakefield 8 – Pike Valley rolled to a 54-8 win over Wakefield in a game that ended at halftime. The Panthers scored 30 points in the first quarter and added 24 more in the second. DeVante Hammer threw touchdown passes to Cole Strickler and Lane Peters in the second quarter sandwiched around a Blaze Payeur 12-yard touchdown run. Pike Valley will host Hartford on Saturday. Sharon Springs-Wallace Co. 48, Stockton 18 – Sharon Springs won 48-18 at Stockton, which pushed the powerhouse Wildcats well into the second half. Sharon Springs trailed 18-12 with 4:03 remaining in the first half after Joel Green recovered a fumble and returned it 27 yards for a score. However, SSWC scored in the final minute of the first half and led 20-18 at the break. The Wildcats extended the lead to 42-18 at the end of the third quarter and 48-18 in the final two minutes. SSWC, which has made the playoffs every year since 2006, has won five straight first round contests. South Barber 60, Minneola 32 – South Barber used a big second half to defeat Minneola, 60-32, at home. South Barber trailed late in the first half but scored on a TD pass from Grant Cantrell to Trae Rathgeber and then converted a two-point conversion with the same duo. South Barber led 32-26 at the break and 48-32 entering the fourth quarter after Cole Coggins returned a kickoff for a score, the fourth special teams TD this season for the Chieftains. South Barber has won the most games in a year since it captured the school’s lone state title with a perfect record in 2005. Dighton 62, Lakeside-Downs 8 – Dighton rolled over a depleted Lakeside team and moved to 10-0. The Hornets led 32-0 with 1 minute, 9 seconds left in the first quarter then added two more touchdowns before the quarter elapsed. Dighton led 62-0 midway through the second quarter and went on to win 62-8. Blair Hoffman had a pair of pick-sixes for the Hornets. Chase 92, Ingalls 44 – Chase made the 132-mile drive to Ingalls and earned a big 92-44 road win. The Kats, after first-round playoff losses five times since 2010, won their first playoff game since a runner-up showing since 1986. Chase led Ingalls, 58-24, at halftime and 86-44 with 26 seconds left in the third quarter.